What's on my mind? Oh, the usual. It's been hot out. Really hot. So hot that I overheard the bigwigs considering letting the factory off early. As busy as we've been lately that's a pretty big deal. it seems like when it's hot out, the company turns into a large scale production of "Goldilocks and the Three Bears" but without the blond chick. The factory guys on the non air conditioned shop floor mumble, "We're too hot." The computer jockeys in the windowless interior offices grumble, "We're too cold." The management and the higher-ups look from their desks in their sunny window offices and say "The temperature is just right." I feel kind of bad bundled up in fleece to keep warm when the guys come in from the factory to ask a question with sweat dripping off their foreheads. Maybe I'll go out at lunch again to defrost. Brr. 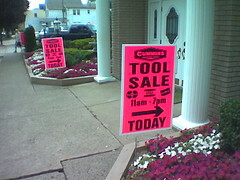 I went to a tool sale today. I figured it couldn't hurt to look around. After all, it was held a walking distance from my house, so anything I bought would have to be carried back over the hill. I can't say I was really expecting much in terms of quality, but I figured that some issues might be OK if the price was right. So I walked over. I have to say that their method of selling this stuff should a enough to make anyone apprehensive. Here's how it works. First, you grab a pen and clipboard as you walk in. One example of each tool is laid out on several rows of tables, each with an identifying number. I might mention that there's no guarantee that the display tools are of typical quality. When you see a tool you want to buy, you write its number and description on your clipboard. When you are done shopping, you pay, then go outside to where a semi is parked. There you hand the attendant your receipt, he finds your tools in the truck and brings them to you. It's a rather risky system for buying refurbished tools if I do say so. It also has a very shady feel to it. Rightfully so, though. This literally IS a fly by night operation. So, did I buy anything? Well actually yes. I did. I decided to shy away from anything expensive. Shopping there was a gamble and I decided not to gamble anything I wasn't prepared to lose. A dial caliper for $20- quality seems decent, if not high. A 24" bolt cutter for $10- It took significant force just to move the handles open and closed when it was new. I had to spend 20 minutes filing powder coat off mating surfaces, loosening tight joints, and lubing each joint with clean grease. Now it's like butta. I can't say if that was a good deal. I guess I can look at as a kit to make a tool. A voltage tester for $4- the kind that senses AC voltage when when placed near a wire. Haven't tried it yet. A laser pointer for $1- You know, for cats. I guess it was an OK trip. An Early Morning Game of "Spot the Icky"
I believe my wife and I may be living with a hound cat and an attack cat. Boots, the black and white one woke us a few minutes ago. He was running around on the bed, staring up at the ceiling with his front paws against the wall and barking (yes, he barks when he spots prey. No kidding.) It turns out that he was tracking a house centipede as it made its way around the crown molding of the bedroom. Given a choice, I tend to let house centipedes go their own way. They are very creepy, surprisingly fast and are predators to smaller creepies. On this occasion, however, I could ignore the bug but not the barking cat (imagine a short percussive meow. Sort of like "mra...mra." It's pretty cute during the day, but not when we're trying to sleep.) So with tissue in hand, I reluctantly stood up on the bed to kill the leggy little creature. That was where the real drama started. In an attempt to avoid an ugly mess on the wall, I attempted to grab the house centipede from the sides instead of simply squashing it. Unfortunately, this allowed it to leave behind a half dozen or so legs in the tissue and begin sprinting down my arm. I immediately felt a case of the willies coming on and flung it to the floor without thinking. At this point Bucky, the gray cat was in pursuit of the little beast, and flushed it out from under the bed where it became tissue fodder. Much too much drama for 3 AM. Maybe now I can get back to sleep. Although you would have a tough time convincing a insurance agent, a speedy car can be a safe place to be in a hostile environment such as New Jersey traffic. As I write this my hands are still shaking a bit from what took place on my way back to work with my Chinese take out. It was a normal day. I was on my lunch break, and taking my time as I rounded the corner on the side of the strip mall near work. Just then, I spotted a run down old brown Toyota Camry headed straight for my side (I was on the outside of the corner.) For a split second I hoped he knew what he was getting into, but it was immediately clear that he didn't. I heard the "SHHHHH" of sliding tires on the wet pavement and saw that the car's front wheels were cranked fully to one side as the car plowed in a straight line, completely out of control. I floored the accelerator as all four fresh tires gripped the pavement and shoved me clear of this buffoon's path. What happened after that was his problem. For a while now, I've been looking around at a site called del.icio.us and have run across many things online that I otherwise wouldn't have. I had just been using the site as more of a spectator to see what other people are bookmarking for a given subject. That, in itself is pretty handy. For some reason, though, I never went to the trouble of figuring out how to make my own bookmarks until today. It really is handy, though. I just decided to start using my account and bookmarked a handful of websites. Now I have a list of bookmarks on a server that I can access from any computer (or my cell phone.) In addition, I can also see who else bookmarked those sites and check out their bookmarks- the assumption being that we have a common interest and would be interested in similar websites. Likewise, others can see my bookmarks. It's a little creepy to have others looking through my bookmarks, in a way, but I don't really see the harm in it. The process of sharing knowledge and experience is mutually beneficial and seems to make it worthwhile. I had been putting off buying tires for quite a while now. I first started looking at tires about a year and a half ago after going four or five different places trying to get a slow leak patched. Pretty annoying, but eventually somebody got it to hold air. Recently, however, the tread on my tires had just been getting too thin, and I knew it was time. After all, nothing affects the way a car behaves more than tires. Your choice in tires can make the difference between a sloppy, cushy ride and a tight handling, tooth rattling ride. The tires even allow for a great deal of fine tuning by varying their pressure. Generally, I can tell a difference of only about two or three PSI in a car I'm familiar with. In addition to my handling enjoyment, proper tire pressures also greatly affect safety, tire life and even the longevity of drivetrain parts. 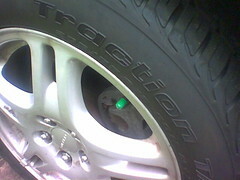 For this reason, it amazes me how little attention auto repair shops, and even some tire centers pay to tire pressure. A couple of weeks ago, as I said, I bought new tires. I bought them from my local warehouse mega store in nearby Clifton, thinking that there's not too much difference between installers. All was well until I picked up my keys and went to my car. I decided to check the pressure, as I've dealt with these mokes before (remember the tire I tried to have patched.) Everything was fine, except that the front and rear tires were switched on one side. That means the 29 PSI on the front and 32 PSI on the rear and the opposite arrangement on the other side of the car. This would not be kind to my differentials. I fixed it and was on my way. Yesterday, I had my 30k mile service performed at ye olde Subaru dealer on Rt 46 in Parsippany. I was happy with the service (although $600 poorer) and enjoying my nice smooth running engine. Something was wrong, though. The handling was noticeably vague and sloppy. I knew right away what had happened, though. I had rolled in off I-80 with nice warm tires. Shortly after I dropped the car off, it was taken inside, tires still warm, where the tire pressure was "corrected". As anyone who drives a car should know, the listed inflation is for cold tires. All four tires were about four PSI low. A professional mechanic should (would) not make this mistake. It makes me wonder what kind of buffoonery takes place under the hood when I drop the car off. It's not the first time this happened, though, and it probably won't be the last. Is it Any Wonder More Americans Don't Ride Bikes?